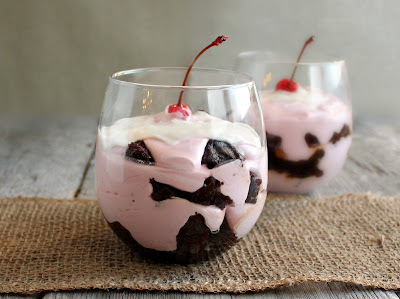 Last summer, my friend Kim from Cravings of a Lunatic, posted a recipe for Black Forest Brownie Mini Trifles and I was instantly smitten. Even though, at the time, Valentine's Day was a long way off, I immediately thought these trifles would be the perfect dessert. So, I pinned the recipe and waited Fast forward to this past weekend, just days away from Valentine's Day, and I went back to check out the recipe and shop for my ingredients. Kim made her own cherry sauce and I have no doubt it was heavenly. But the thing is...it's not cherry season now. Hmm... Frozen cherries? Canned cherry pie filling? Oh, dear. In the end, I took the inspiration from my own recent Chocolate Raspberry Swirl Bundt Cake and decided to use cherry preserves and cream cheese. It wasn't exactly what I had in mind to do when I first saw Kim's trifle but the result was actually really good. Truth be told, I am not much of a brownie fan but Brian really loves them. So I only made two trifles and left the rest of the pan of brownies for him. But after he tasted the cherry trifle, he said the plain brownies were suddenly uninteresting. 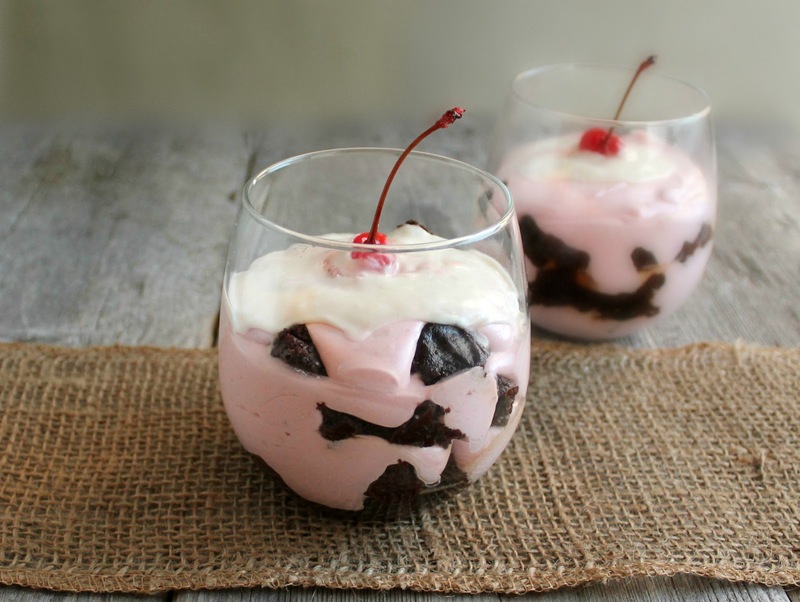 OK, more cherry trifles coming up! I still want to make Kim's original recipe when cherries come back into season. But for now, this will do quite nicely. Enjoy! To make the brownies, melt the butter and chocolate together in a double boiler or microwave oven and allow to cool. Beat together the eggs, sugar and vanilla until smooth, add in the cooled chocolate/butter mixture and continue to beat until fully incorporated. In a separate bowl, sift together the flour, baking powder, cocoa powder and salt. Add the dry ingredients to the wet and blend until all the flour is incorporated. Line a baking dish with parchment paper or aluminum foil and pour in the batter. Bake in a pre-heated 350 degree oven for 1 hour. To make the cherry cream, combine the cherry preserves and water in a small bowl and microwave for about 20 seconds. Stir well. In a separate bowl, cream together the cream cheese and sugar. Add the cherry preserves and stir to combine. 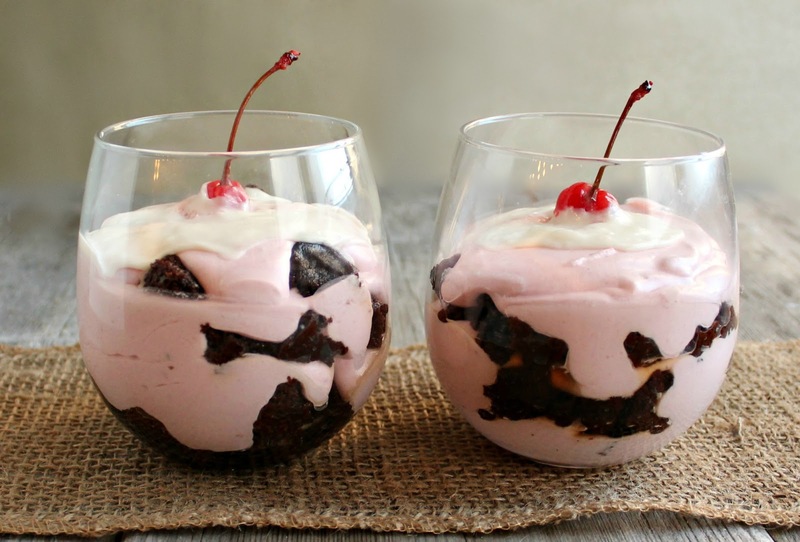 Assemble each mini trifle by crumbling a few brownie pieces into a dessert dish, layer on a couple of tablespoons of cherry cream and repeat the process twice more. Garnish with some whipped cream and a cherry, if desired. Makes approximately 8 servings. Awww such a sweet Valentine's treat! You are so good to Brian! I think you did Kim proud with this one! Great call to use the preserves in the winter. Dude these are gorgeous. I mean out of this world pretty. I love how you mixed it up with cream cheese and preserves. I think I may have to make your version now. This could turn into an endless series of cherry recipes. Did I tell you I'm doing cherry week soon? This might work perfectly for it. Also I am stunned you don't care for brownies. I go crazy for ooey gooey fudgey ones. They never even have time to set up and cool. Me and mini-me demolish the entire pan before it ever gets a chance. This is a very special dessert, very pretty! A simple and delicious dessert, I like this! This looks so tasty and elegant! These are just gorgeous, Anita! This is when I wish the hubby would eat cherries in another form besides Kool-Aid...sheesh. So pretty! Very festive. Makes me sad I didn't plan a V-Day recipe that was all pink and cute ahead of time! I would probably have a hard time going back to regular brownies too! These look so delicious. What a great dessert for Valentines. Thank you for sharing with me! I hope you are having a wonderful week! This is down right gorgeous! Perfect for a dinner party, too! These look amazing and dangerous! I would love it if you joined our "One last Valentine's Day Round Up"
Linky Party and shared this! These look simply delicious. I wonder if I can use Cherry juice concentrate instead of the preserves. thanks for sharing on Foodie Friends Friday Way.